in front of Nativity church in Port-au-Prince. April 2010. Photo: Serge McKenzie. I attended liturgy for St. Thomas on Sunday at Notre Dame de Nativite in Port-au-Prince, Haiti. It was difficult to get to. The church is in a neighborhood very close to the airport but it is well concealed from large paved roads and the entrance to the airport. The wonderfully expert driver, Freddy, drove on winding streets that have not been paved for years. We went through potholes many feet long filled with rain water, past spontaneous tent camps set up in people's yards. At times there was a horrible stench. Many buildings were in ruins, some were fine, some rebuilt. The church is down a narrow dirt road. Most people did not know where to direct us. There are several small churches in the area. 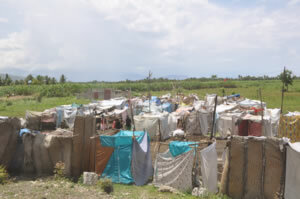 People on the street look dazed and upset, we could see people living in wretched conditions in tents. I felt both guilty and relieved at being there with an Embassy driver. The church is in a basement - the basement had been built, but not the main church, which is still to be built above. The foundation was done well and survived the earthquake, but there had been some damage to the roof and walls which has now been repaired and the church is painted inside a very clean white, and there are quite a few icons. There were maybe 100-120 people, and I was by far one of the oldest there, many young people and children. There is a small choir of three-four men but the entire congregation signs together in a most pleasingly enthusiastic manner. The chants were familiar ones to all of us, with just a lot more rhythm to them. Fr. Jean Chenier-Dumais shocked me by asking me to speak to his parish. I was unprepared but said a few words in my best French, just simply about being from the parish of St. John the Baptist in Washington, that we have been fortunate to have Fr. Gregoire as a visitor, and that we have prayed for them and done our best to assist. Fr. Jean told us that his own house has been destroyed, as is his store. He is very grateful to Fr. Victor Potapov and to his parish and was very pleased to see someone from Washington. He is also very grateful to the Synod and to all parishes that have come to his assistance. After the service I saw some of the damage to the exterior of the church. Also I saw how close a tent settlement is to the church - literally a few feet away. I spoke to a few parishioners, some of whom come from very far away. Everyone seems well dressed. I think clothing supplies were one thing that relief agencies were able to send easily. I have seen people leaving tent camps in chiffon dresses that look like little flower girl dresses. However, this does not mean that people are doing well. Also, people do not look emaciated. I think there has been food getting in. There are tent camps with about a million people, there is poor access to running water and of course electricity and housing is destroyed. Lives are totally wrecked.